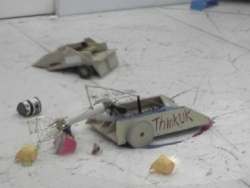 ‘Symbio’ was devised with Prof Noel Sharkey and Roboteers from ‘Robot Wars’ Chaos 2, Bigger Brother and Anarchy/101 teams for an event in Beijing, China to promote UK Engineering as part of the British Councils’ ‘Think UK’ initiative. 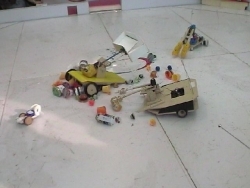 Over 6 days we guided novice Roboteers, through building pairs of robots, one small, one larger. These robots then worked together in the ‘Symbio’ game by competing in an arena with 3 other pairs from across China in a Nationally televised competition, gathering securing and protecting(!) supplies of food. 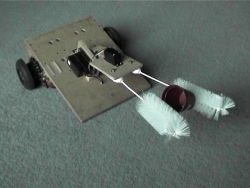 The kitten weight robots were essentially upgraded ant-weights whose role was to guard the collected food from pilfering and to sort the bad food from the good. The cat weight robot had to lift its kitten onto the storage area, and then pass up the food as it was gathered in. 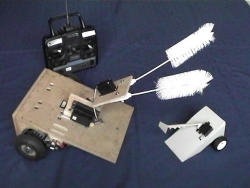 Heavy-duty servos were used for the cat weight arms and grippers, and they were powered by stripped down 12v cordless drills. Of course tactics soon evolved, and raiding of the other teams’ food stores quickly became the norm!